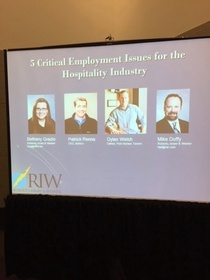 May 11, 2015 – 23rd Annual Restaurant Trends Seminar. For additional information or to review a company’s handbook contact Dave at (617) 742-4200 or dwr@riw.com. In the beginning, it was a fairytale relationship: young and growing GC meets capable and experienced subcontractor. Everything seemed so effortless then – the bids fell exactly into place, the schedule was always met, the work was flawless and payments were never a problem. Then, slowly, things began to change. At first you chalked it up to innocent mistakes – a missed item here or under-ordered materials there. But then the mistakes became more common and carried greater potential risks – the wrong insurance certificate or a call from the local union rep about a few missed benefit payments. Most recently, it’s as though the sub has just given up. Refusing to sharpen its numbers. Woefully understaffing the job. Failing to pay lower-tier subs and allowing liens to hit the project. Perhaps they’re directing their affections to a new GC or maybe they’re just taking you for granted, assuming you’d rather deal with their shortcomings than have to go back out on the bidding scene. Whatever the reason, it’s clear that the bloom is off the rose. The shine is off the apple. It’s time to part ways. Terminating a subcontractor is typically contentious. Most subs believe they either performed properly or should have been given another chance to remedy the problem. The way in which the GC approaches termination of a subcontractor can be the difference between a clean, healthy break and a long, drawn-out separation and the inevitable heartache and price tag that comes with it. Click here to read full article. by Christopher A. Agostino, Esq. and Michael D. Rosen, Esq. High startup costs represent a barrier to entry in many industries, but none more so than in hospitality and retail. One large outlay that confronts most new restaurant operators is the cash security deposit for a lease. While landlords may be quick to demand cash security deposits from restaurant tenants – the more cash the better – a restaurant operator may be well served by suggesting a stand-by letter of credit as an alternative. A letter of credit in lieu of cash frees up capital at a critical point in the lifespan of any restaurant and may provide benefits to both landlords and tenants during the tenure of a long-term retail lease. Restaurant tenants may also see the benefit of a letter of credit if a landlord becomes insolvent. Commercial landlords are generally allowed to comingle tenants’ security deposits with their own funds; therefore, if a landlord encounters financial difficulty its tenants’ security deposits are at risk. At any given time, a cash security deposit could be converted by the landlord for its own use or taken by an attaching creditor or the landlord’s bank. If the landlord’s depository bank is also a secured creditor, the bank could simply reach into the landlord’s operating account and take the funds without notice or demand to the tenant. Moreover, if the landlord files for bankruptcy protection, a tenant’s claim for return of its security deposit could stand in line with other general unsecured creditors, absent expensive legal wrangling to prove a constructive trust or other priority claim to the funds. It may be possible to address some of these issues in a negotiated subordination, non-disturbance and attornment agreement between the tenant, the landlord and its bank, but a tenant could avoid landlord insolvency issues altogether through use of a letter of credit. So long as the tenant is not in default under the lease, a properly drafted letter of credit should be outside the scope of any claims or liens asserted by landlord’s creditors. While these issues may seem remote, turmoil in the real estate market in the not too distant past is proof positive that these possibilities should at the least be understood and considered, depending the landlord in question. Click here to read full article. Lawyers always want to put everything in writing. But in this case we think it just makes great customer relations sense. Diners are always impressed with a servers’ ability to rattle off a whole list of specials by memory. Sometimes the details just go easily in one ear and out the other. So in consideration of those distracted diners, it might be appreciated if the server could leave a printed copy of specials behind on the table. That’s a real help to the customer and will reduce the number of times a server needs to come back to repeat themselves. Santouka Ramen opens new location in Harvard Square, Cambridge. Woods Hill Table opens in Concord. Loco Taqueria & Oyster Bar opens South Boston location. 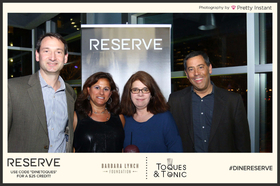 Pictured left are Russ Stein with wife Rebecca and Lou Katz and wife Jean attending the Barbara Lynch Foundation Boston Homeless event. 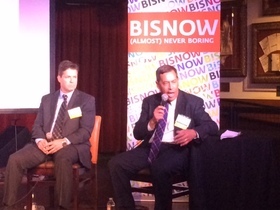 Lou Katz moderated a panel at the Bisnow Boston Restaurant Development Summit. The event took place at the Hard Rock Cafe, Boston. Also pictured is RIW client Austin O’Connor of The Briar Group.